Instagram started out as an image-sharing app with only a tiny workforce. It found a sweet spot in modern society that combined vanity, social networks and a shift toward visual media. And then one day Mr. Zuckerberg decided to pay a billion dollars to acquire it. Soon it was a tool for many; famous celebrities, politicians, marketers, and even some top-notch businesses. Today, Instagram ranks 7th on the list of the Top 15 Most Popular Social Networking Sites with over 100 million unique monthly users and over 300 million active users posting photos and videos every day. Apart from the 15-second video sharing option, we’re all excited about the new feature Instagram plans on releasing by the end of this year: targeted advertisements that show up on user’s photo feeds. Paid ads, means more chance to make money. If you’re interested in monetizing your Instagram account, here are 9 ways to turn those pictures into profits. Successful marketing on social media is almost directly proportional to having a long list of followers. Whether the followership was obtained before your marketing efforts or after is beside the point – you just need a significant amount of Instagram followers! The more you have, the more you are “seen” and the greater your chances are of turning leads to sales. There are several ways you can grow your followers on Instagram. Some of the most effective ways have been highlighted by Melyssa Griffin, tactics such as; liking photos in your niche, socializing, asking people to follow you, running contests, and more. Also don’t forget to follow and post on several hashtags in your niche. Product links and links to your blog are crucial when it comes to making money on Instagram! Every single image, video, or whatever else you share must include CTA’s (in this case links to your blog or wherever they could purchase the item). Also make sure you place an item number or tag that could make their purchase easier. Instagram currently doesn’t allow clickable site links, so for now the users will just have to do with re-writing the link in their browser window. 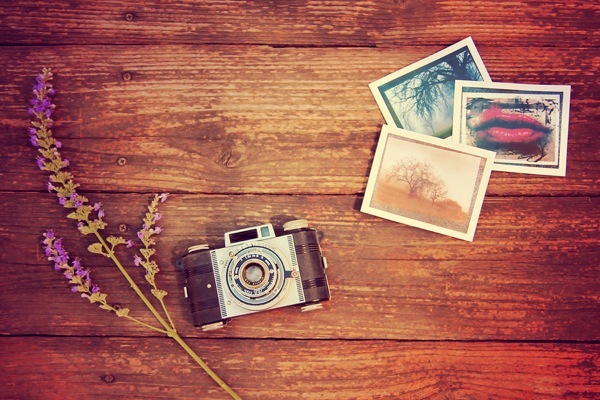 Despite the new features, Instagram is, and always has been about sharing beautiful images. Nothing will entice your prospects or monetize your account more than high quality, beautiful images. 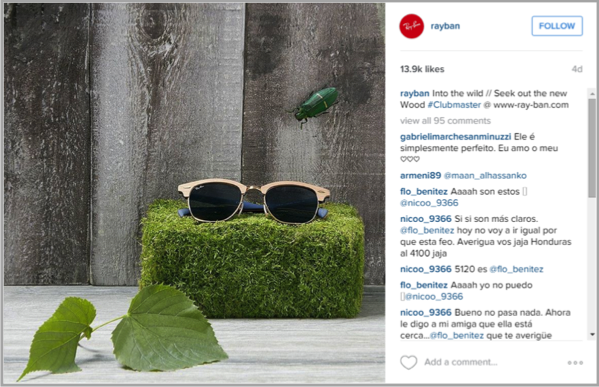 Show your followers what your brand is about with images that appeal to their visual senses. Show off your products, tell them your brand story, create graphically altered images and get creative. If you’re a gym service for example, you could show off pictures of hot hunks doing their work-outs. If you’re a yoghurt selling service, share images of your product and perhaps other ways you could use that yoghurt in recipes. Check out how Starbucks does this with amazing graphics, artistic pictures of Starbuck cups, and their latest coffee creations. Always be sure to share photos of your latest products. For example, you could be writing a new book. Take a cool snap of the cover and share it with a release date. If a picture is worth a thousand words – then what is a video (which is comprised of practically thousands of pictures) worth? You do the maths! Thanks to Instagram’s latest feature (and competition with lead rival, Vine) there is a 15-second video sharing option that you get creative with. Come up with a personal message for your fans and tell them why you think they should try out your new product. Or perhaps, you could share a 15-second fast-paced process of how you build your creations. There’s no limit to how creative you can get with video building! Check out top brands on Instagram and Vine for some video sharing inspiration. Many fans and followers are willing to endorse your brand only for a little recognition – and of course a post about them on your profile. This is a great way to engage your followers as well as outsource original, quality content. Give your followers a chance to submit their photos with your product, share their “experience” in a video, or anything they like. The best submissions could get discounts on your products, a small reward, or perhaps just a little recognition through your brand name. 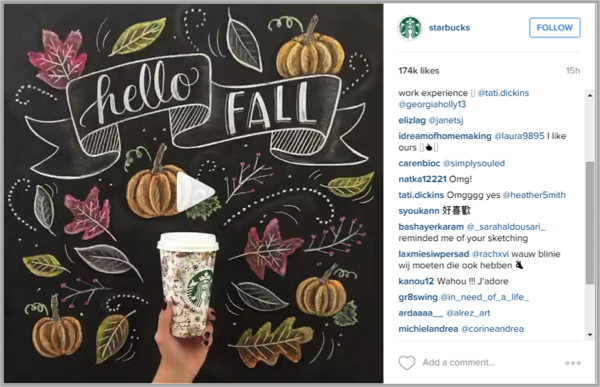 Here’s a great example of Starbucks latest “Hello Fall” video contributed by an artistic fan after they introduced the Fall cup. 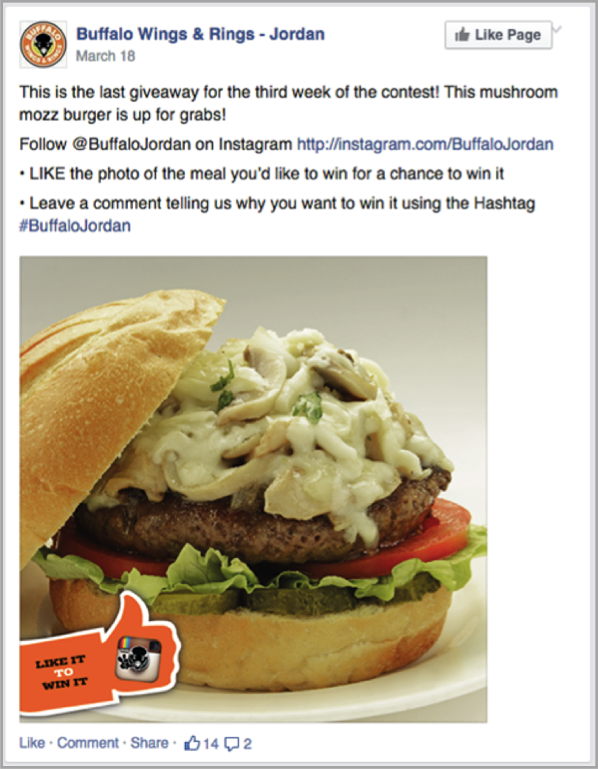 Get people to like your images and follow you because you’re running a cool campaign or an event. Offer exclusive deals for a short period of time and keep updating your users on how time is running out (urgency works!). Sharing special promotions or coupons is another way to get your followers involved in a contest and turn those leads into sales. Ask them to double-tap or tag a friend to get their name in the draw box. One of the best advantages of running contests and campaigns on Instagram is that you can create separate hashtags and keep all contributions in one place. Get happy clients to upload pictures or videos of themselves using your product. There’s nothing more convincing than a handful of images, videos, or testimonials that provide social proof. If you know a celebrity like Kim Kardashian, you’re one lucky duck! But, of course not everyone has direct access to the Kardashians, much less their Instagram profile. However, there are other people who have big followings on Instagram that are much more accessible. For example, if you’re selling women apparel look for popular online influencers such as fashion bloggers, entrepreneurs, or social media gurus that have a large fan following. Plenty of blogger models are willing to share what brands they wear and why purchasing from a specific brand would be a good idea. This is a great way to generate referral traffic through links to your blog as well as your branded Instagram hashtags. Use an app to do a bulk of the work for you! The number of tools out there for boosting your Instagram marketing is overwhelming. Iconosquare: This is a tool that provides Instagram users with advanced statistics about their profile such as total number of likes received, average number of likes and comments per photo, most liked photos, follower growth charts, and more. Repost: Allows you to re-post an amazing retina-ready image from another Instagram user’s profile while still giving them the credit. Instaquote: Share inspiring “quotes of the day” and keep your followers engaged. Postso: This is a post scheduling app that makes a busy marketer’s life easy. Schedule your posts, specify a location, sit back and relax. Piquora: This is a visual marketing app that will curate and suggest the best photos for your posts that can pull content based on geography, language, and specific locations. Guest Author: Alison Stone works at Dissertation cube where she provides dissertation writing help to students. In her spare time she writes blogs for students starting their career and for those who are still in jobs. Find her on Google+.